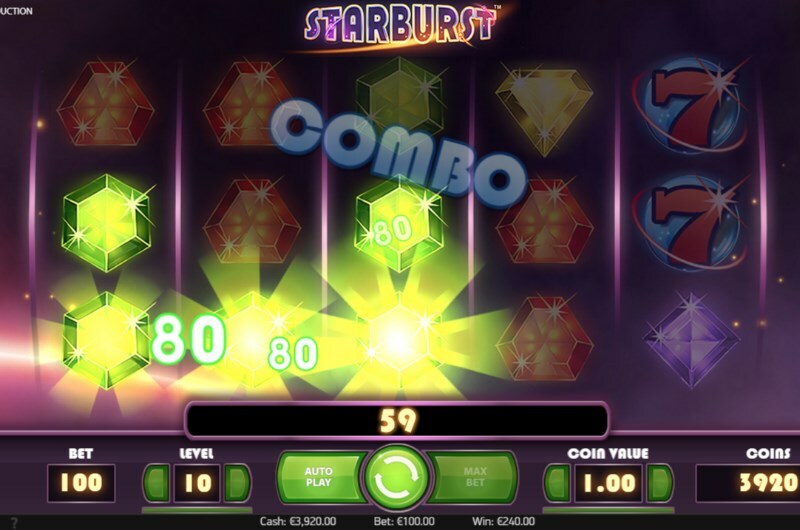 Starburst slots is a space-themed video slot developed by NetEnt. The game was first introduced to online casinos in 2012. The slot quickly became popular due to the simple, yet satisfying gameplay. Beautiful graphics, stunning sound effects and delicious gameplay - it was soon considered to be NetEnt’s best slots. Thanks to mobile devices, the game has found an even bigger fanbase. The slick and intuitive gameplay is almost perfect for smartphone and tablets. It’s no wonder Starburst bonus codes are all the rage these days. NetEnt’s slot features 10 paylines, five reels and three rows. You can bet from as low as 10p per spin - or as high as £50 per spin. Budget players will certainly find this game an attractive proposition. But high rollers wanting to spend more per spin may need to consider other options. In a unique twist, Starburst is actually a “both ways win” style slot. That means you can win on the 10 paylines from left to right - and right to left. This effectively doubles the ways to win compared to a standard 10 line slot. 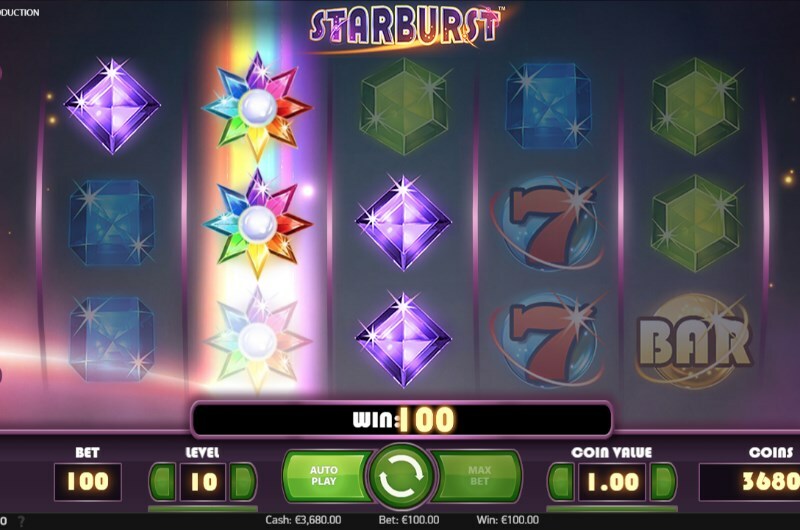 While there is not a specific Starburst slots free spins bonus round, the multicoloured wild symbol will activate the game’s main bonus feature. When the expanding wild appears on one of the three reels, it will fill the whole reel, triggering a free re-spin. This online slot really kicks into high gear if another wild appears, which will again result in another expanded wild and a further free re-spin. Max wins on this slot game are easy to achieve if all three central reels are filled with wilds. One criticism of the slot is the lack of extra bonus mechanics. But with only one feature, game rounds in this game are much faster than your average slot game. This means more betting opportunities in a shorter space of time. In a crowd of games vying for your attention, this game stands out thanks to its simple but perfectly designed bonus feature. Visually, this is one of the most stunning looking slots in online casino. A collection of precious gems sits in front of a space background. The brightly coloured jewels against the dark backing create a unique contrast. The most striking looking symbol in the game is undoubtedly the Starburst wild. This is the symbol that defines the game - and will be instantly recognisable if you have even played the slot for one minute. 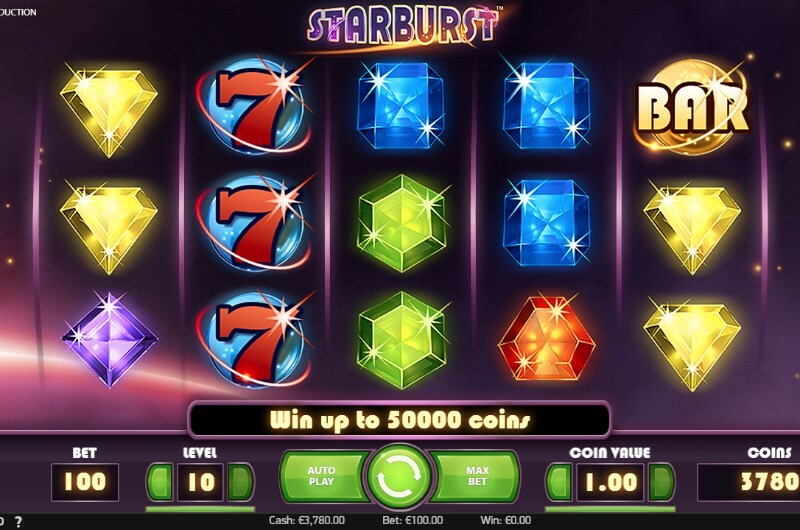 Using a Starburst slots signup bonus, you can really appreciate the superb graphics. But this game also impresses with animation work too. Land a symbol win and you will be greeted by a symphony of bright lights and arcade sound effects. Overall, NetEnt’s most popular game is one of the best looking and sounding too. Before you start tapping that spin button, you will need to choose your stake. Thanks to the straightforward controls, this is easy to do. You have options to either increase the bet per line or the overall bet level. Adjusting by bet line will change the number of coins wagered on each line while adjusting the bet level will change the value of the coins. Tweak these values until you are happy with the cost per spin; bigger value spins mean bigger rewards, but low value spins can always produce a surprising result. One useful feature of this online slot is the autoplay setting. If you don’t want to spin manually for hours on end, you can choose to set the slot to play itself for a set number of spins. What’s even better is that you can set the autoplay to end on certain triggers. This includes if you lose a certain amount, if the main feature activates or if you hit a big win. To win in this slot game, you will need specific combos of symbols to fall on one of the ten paylines. Each gem symbol has a different value and these values can be found in the fully illustrated paytable. For the biggest value wins, you will want to aim for the bar symbol or the triple sevens. One symbol you will definitely want to keep your eye out for is that lucrative wild symbol, which can appear on reels two, three or four. This symbol can substitute for other symbols in a winning payline. No matter which Starburst slots review you read, no one will deny how easy it is to play this slot. 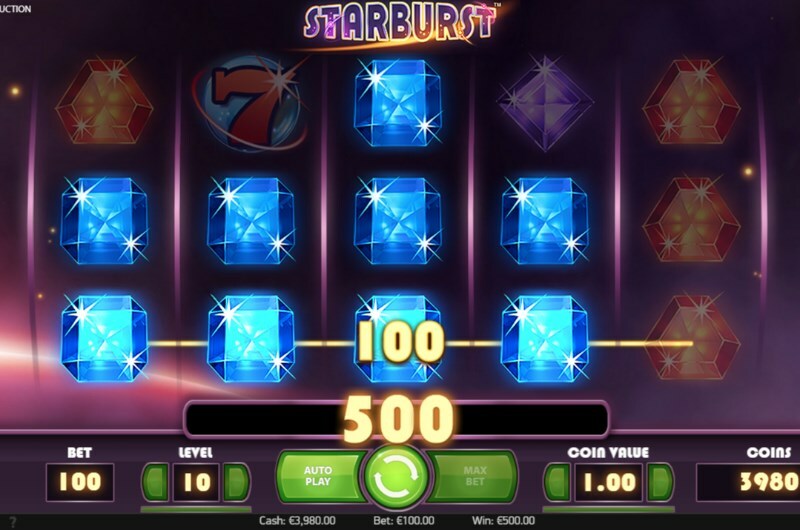 Starburst is a low variance slot - this means that wins on the game occur regularly. But due to this frequency of wins, the prize amounts are reduced. This game is very much the opposite of high variance slots, which payout at a much rarer frequency - but offer far more valuable payouts. If you are more accustomed to the second style of slot, then NetEnt’s classic may not be the ideal game for you. The theoretical return to player on this game is a relatively high 96.1%. When the game was launched in 2012, you could almost tell it was designed for the future smartphone and tablet craze. The game is simply perfect on mobile; the fast and fluid action translates well to portable devices. There are no special apps or software packages to download to play the slot on the go. You simply need to sign in using your favourite browser and then open the game. Because this is a low variance slot, payouts in the game are somewhat limited. The game is, however, able to award a maximum payout of £50,000. A combination of bar symbols and wilds are sure to payout handsomely if you’re lucky stars can align. Everyone wants to play Starburst online nowadays. And we totally understand; it’s a phenomenal game and a master class in design, making it one of the best NetEnt slots. The slots real charm lie in the user interface and the simple, but excellent game features. While other games progressively try to make things more complicated, this 10 payline masterpiece shows us sometimes simple works best. No wonder the game is so popular for a free spins no deposit bonus!